Grace Industries Inc. is pleased to announce the new “one of a kind” NFPA compliant firefighter Stand-Alone Personal Alert Safety System (PASS) and RF PASS. The National Fire Protection Association (NFPA) is responsible for establishing safety standards for the fire industry including fire department personal protective equipment (PPE) in the United States. All firefighters in the United States are required to use NFPA compliant PASS alarms. The term PASS alarm is known globally as a Distress Signal Unit (DSU). NFPA1982 is an equipment design standard which defines the design criteria of the PASS/DSU alarm; and NFPA1500 is an operational standard which defines how the PASS is to be used on the fire ground and in other hazardous environments. A PASS/DSU must first be NFPA1982 compliant before it can be NFPA1500 compliant. The NFPA1982-2008 Edition has been replaced with a higher design standard of NFPA1982-2013 Edition. In order to earn NFPA1982-2013 Edition compliance, manufacturers’ have been challenged to design and produce PASS alarms to a higher standard design requirement, along with new, more stringent, testing criteria. Grace Industries is the only manufacturer who meets the demands of the current NFPA1982-2013 standard with the one-of-a-kind stand-alone SuperPASS® 5, SuperPASS® 5X and TPASS®5 PASS/DSU alarms. Because it is a stand-alone PASS/DSU, and does not require an SCBA to operate, it can be moved from one piece of protective clothing to another. The stand-alone feature of the PASS/DSU keeps firefighters within NFPA1500 compliance for use of PASS alarms at all times and within all hazardous environments; even those environments that do not necessitate use of an SCBA. A problem within the fire industry exists for firefighters who remove their Self-Contained-Breathing-Apparatus (SCBA) and then continue to work on the fire ground during fire overhaul and other operations. Most firefighters today are using PASS/DSU and RF PASS systems which are integrated into the SCBA, and require the firefighter to wear the SCBA to use the PASS/DSU system. When the firefighter removes the SCBA, and continues to work on the fire ground, it places them in danger and out of compliance with NFPA standards. Grace has solved this problem for the firefighter with their new “one-of-a- kind” standalone fifth generation SuperPASS®5, SuperPASS®5X and TPASS®5 (NFPA compliant standalone PASS and RF PASS). The Grace stand-alone PASS and RF PASS are not integrated into any SCBA and do not rely on a firefighter having to wear the SCBA to stay protected. Grace is the only manufacturer with a stand-alone NFPA compliant PASS and RF PASS that protects every firefighter regardless of whether an SCBA is worn. A major contributing factor leading to fire ground injuries has been congested radio voice channels. High levels of voice radio traffic lead to chaos and confusion, putting firefighters at risk of not hearing critical messages such as the evacuation command or call for PAR; this is a second problem solved by NFPA Compliant Grace RF PASS and In-Command® accountability systems. The wireless Personnel Accountability Report (PAR) check is a function of the accountability system that significantly reduces radio voice traffic on the fire ground while keeping the Incident Commander “in the know” with afull report of acknowledgements from their crew. NFPA In-Command® First-In Emergency Signaling and Automated Accountability System. Grace has developed the “one of a kind” stand-alone firefighter SuperPASS®5X functioning as a traditional audio PASS alarm that when field upgraded becomes an RF PASS with all of the performance and features of a TPASS®5 for use with Grace In-Command® accountability systems. The SuperPASS®5X is the first device to provide a field upgradable migration path for budget conscious departments and a “ladder up” into Grace Fire Fighter In-Command® Emergency Signaling and Automated Accountability Systems. The 2013 NFPA Compliant TPASS®5 improves upon the prior-gen TPASS®4 and features a smaller, lighter and louder RF PASS with a new internal antenna design. The TPASS®5 and upgraded SuperPASS®5X are backward compatible with Grace’s Firefighter Accountability Systems including In-Command® upgraded with First-In and In-Command® Full Crew. These systems are designed to fit the operational structure of all departments regardless of size. Grace SuperPASS®5 and TPASS®5 systems are stand-alone, do not require integration with SCBA breathing apparatus, and satisfy NFPA requirements to protect all fire ground personnel inside or outside of the hot zone. Many firefighter accountability systems in use today are manually-operated and complex, requiring dedicated personnel to manage and do not protect all firefighters on the fire ground. Because these systems rely on a PASS that is integrated within the SCBA, these systems leave the remaining fire ground personnel outside of the hot zone unprotected. Grace’s In-Command® First-In and In-Command® Full Crew Emergency Signaling Accountability Systems are the fire industry’s only NFPA compliant accountability systems that will support stand-alone RF PASS and protect firefighters when they remove their SCBA. The Grace In-Command® First-In Emergency Signaling Accountability System does not require integration with breathing apparatus and is designed to support all members including personnel of a smaller department’s “first-in” crew who do not always have the time or personnel to set-up a full accountability system. When used with the In-Command® First-In Tablet Application, the In-Command® First-In Emergency Signaling Accountability System is an NFPA compliant accountability system. First-In Tablet is simple to use and quick to deploy. The heart of the system is the Wi-Fi enabled Incident Alarm Monitor used to communicate with the In-Command® First-In Tablet App for Android. The Incident Alarm Monitor also is used to alert fire ground personnel with an extremely loud siren, strobe light and provides an EVAC push-button to send an RF Evacuation signal to TPASS®5/5X. In-Command® Full Crew is a second NFPA compliant PC based Emergency Signaling and Automated Accountability System designed with all of the features of In-Command® First-In and with advanced features that fit the operational structure of larger departments. In-Command® Full Crew provides mutual-aid accountability and monitoring using Windows 7 version software designed for use on laptops and Windows tablets. 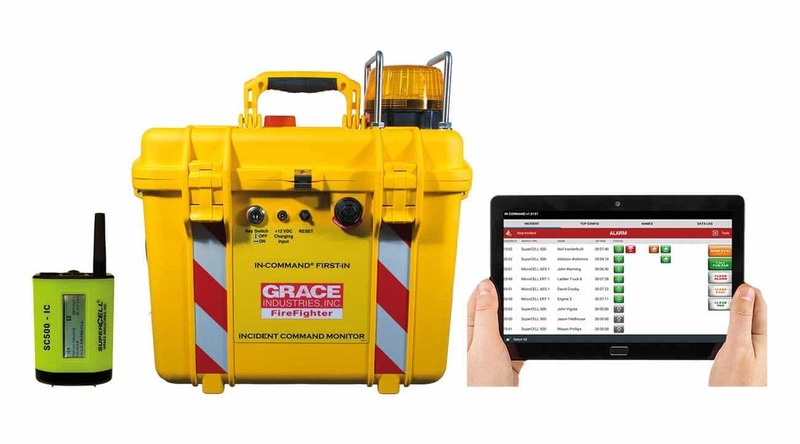 Since 1974, with close to a million PASS alarms sold, Grace Industries continues to be known as a pioneer in the development and manufacture of standalone firefighter PASS, as well as, a developer of “Solutions for Life Safety” within Industrial, Mining and Transportation markets in more than 31 countries. Grace offers a diverse suite of wireless RF Lone Worker personal safety products, as well as, visual alerting and audio alarm safety products.